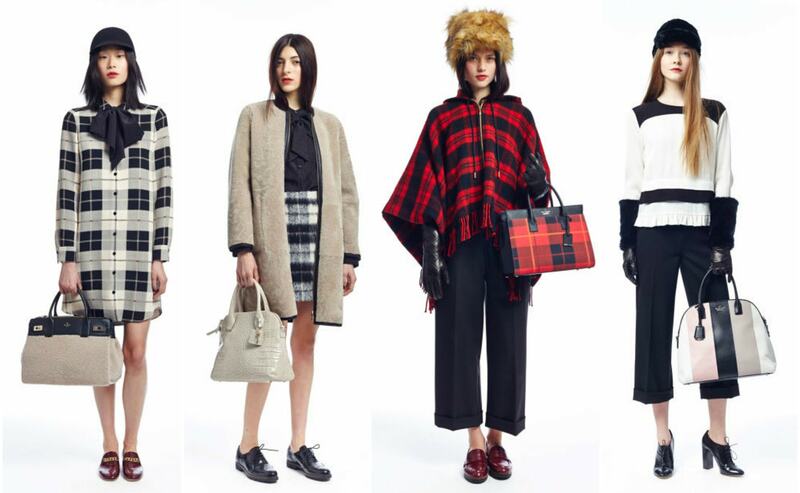 Let Kate Spade’s plaid-heavy fall 2015 collection inspire your winter wardrobe. Kate Spade’s Fall 2015 collection, in a word, is classic. In traditional fall/winter form, the collection revolves around plaid, accented by navy blue leather and fur. Want to get a runway-ready look for a fraction of the price? Below I’ll show you how to recreate three looks inspired by Kate Spade Fall 2015. I absolutely love the simplicity of this look. This look jumped out at me because of its relaxed vibe – I don’t always think “relaxed” when I think of Kate Spade, but this look is so downtown cool thanks to its oversized fur coat and navy joggers. To recreate this look, you’ll need a navy blue scoop neck tee and dark blue loose-fitting casual pants. Add a caramel brown and black coat as your accent piece – the fur trim on this one mimics the all over fur of Kate Spade’s version. Finish the look with navy blue Keds and a nifty backpack. 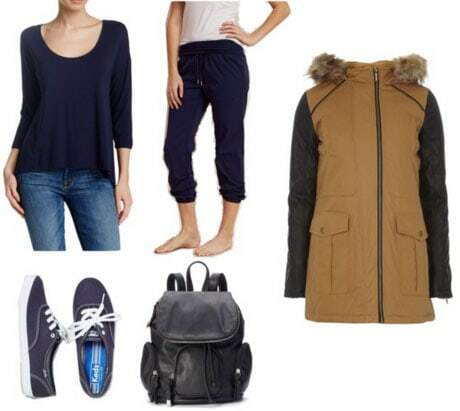 This ensemble is the perfect look for class. This look embodies the perfect combination of sophistication and edge. A pop of vibrant red color blends seamlessly with its navy blue complement. Leather and fur add a fashion-forward pop. Re-construct this masterpiece with a vintage-style sweatshirt tucked underneath a bold red skater skirt. Top it off with a deep navy blue duffle coat. Finally, accessorize with a tan clutch and breezy blue flats. This combination would be great for your next semi-casual night on the town. Kate Spade is here to upgrade your business attire with this modern-day look. This fashion-forward ensemble uses a uniform color palette with pops of white to create a serious statement. 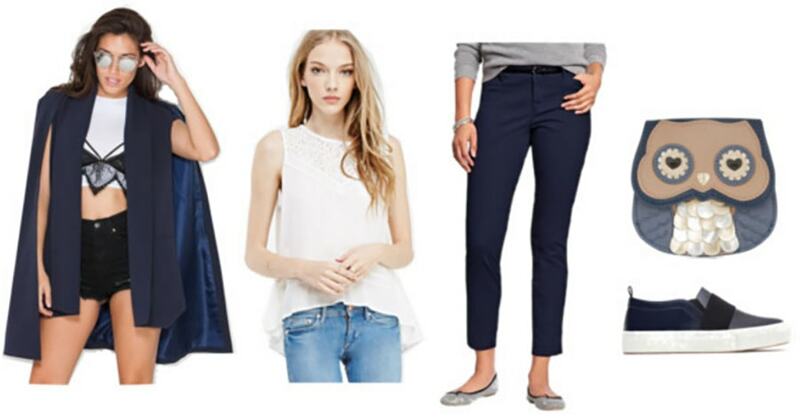 Assemble this look by starting with a white lace sleeveless blouse as your base. (Wear it now and through spring!) Add a stylish, navy blue cape blazer and matching slim fit trouser pants. 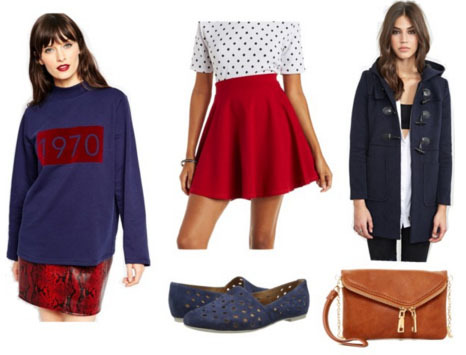 Complete the look with canvas slip-on sneakers and a fabulous owl clutch. This look would be a lovely choice for your next interview. What do you think of Kate Spade’s Fall 2015 collection? Which outfit would you wear? Remember to share your thoughts in the comment section below!